Germany: Hermann Goering, the German Reichstag President, announces that Adolf Hitler is above the law. Spain: Day 361 of 985 of the Spanish Civil War. CBI - China: Day 6 of 2,987 of the 2nd Sino-Japanese War. Day 6 of 33 of the 2nd Battle of Hebei. Japanese troops continue moving more units into China. Spain: Day 726 of 985 of the Spanish Civil War. CBI - China: Day 371 of 2,987 of the 2nd Sino-Japanese War. Day 32 of 139 of the Battle of Wuhan. CBI - China: Day 736 of 2,987 of the 2nd Sino-Japanese War. Day 29 of 68 of the Battle of Tianjin. CBI - Mongolia: Day 63 of 129 of the Battle of Khalkhin Gol, a border dispute between the Soviet Union and Japan. UK: Operation FISH: British ships arrive at Halifax, Nova Scotia, Canada, with $1,750,000,000 (US) worth of gold and securities from the Bank of England, destined for the Bank of Canada's vault in Ottawa. Atlantic: German sub U-56 attacks British transport ship DUNERA with a torpedo in the North Channel between England and Ireland. The torpedo glances off the ship without exploding. What U-56 did not know was that DUNERA was carrying Italian and German POWs bound for Australia. Atlantic: German sub U-99 sinks the Greek ship IA 160 miles southwest of Ireland during the early hours. Later during the evening, U-99 stops the Estonian ship MERISAAR and forces her to sail to the German-occupied French port of Bordeaux. However, on 15 July before arriving there, she will be sunk by the Luftwaffe. ETO - UK: Day 3 of 114 of the Battle of Britain. The Luftwaffe bombs Aberdeen in Scotland, Cardiff in Wales and Portland and Exeter in southern England. MTO: In the Mediterranean Sea, Italian bombers attack the British battleship HMS WARSPITE and cruiser HMS LIVERPOOL. The bomb hitting the HMS LIVERPOOL is a dud. East Africa: Day 33 of 537 of Italy's East African campaign in the lands south of Egypt. CBI - China: Day 1,102 of 2,987 of the 2nd Sino-Japanese War. Day 241 of 381 of the Battle of South Guangxi. South America: Day 8 of 27 of the Ecuadorian-Peruvian War, a territorial dispute between Peru and Ecuador. UK: The Soviet Union and Great Britain sign a mutual assistance pact declaring that neither state will make a separate peace with the Axis powers, pledging no separate peace. Russian Front - Finland: Day 14 of 142 of Operation SILVER FOX, a joint German-Finnish campaign to capture the Russian port of Murmansk in the Arctic. Russian Front - Finland: Day 12 of 140 of Operation ARCTIC FOX, a joint German-Finnish campaign against Soviet Northern Front defenses at Salla, Finland. Russian Front - Finland: Day 21 of 164 of the Battle of Hanko. Russian Front - Finland: Day 3 of 18 of Finland's reconquest of Ladoga, Karelia. The Finns continue their offensive toward Lake Ladoga northeast of Leningrad. Russian Front: Day 21 of 167 of Germany's Operation BARBAROSSA, the invasion of the USSR. Russian Front - Center: Day 7 of 31 of the 1st Battle of Smolensk, Russia. German Army Group Centre needs this town so they can continue on to Moscow. Russian Front - South: In Ukraine, units of German Army Group South begin preparing an assault on Kiev. Russian Front - South: Day 11 of 21 of the Battle of Bessarabia, Russia. German and Romanian troops continue their attack at Bessarabia to take the land and city that Romania was forced to cede to the USSR a year ago. MTO - Libya: Day 94 of 256 of the Siege of Tobruk. Middle East: Day 35 of 37 of the Battle for Syria and Lebanon. Vichy troops surrender to the British and Free French Forces while armistice terms are being discussed. East Africa: Day 398 of 537 of Italy's East African campaign in the lands south of Egypt. CBI - China: Day 1,467 of 2,987 of the 2nd Sino-Japanese War. ETO - France: US 8th Air Force, flying A-20s borrowed from the RAF, bombs the Abbeville/Drucat Airfield. Russian Front - North: Day 308 of 872 of the Siege of Leningrad. The Volkov pocket is eliminated by German troops, with over 30,000 prisoners taken, including General Andrey Vlasov. Russian Front - North: Day 69 of 658 of the Siege of the Kholm Pocket. Russian Front - Center: Day 11 of 22 of Germany's Operation SEYDLITZ, a plan to trap and capture numerous Soviet troops. Russian Front - South: Day 15 of 27 of the Battle of Voronezh, Russia. Russian Front - South: Day 15 of 150 of Germany's CASE BLUE, the failed offensive to take the Caucasus oil fields. MTO - Egypt: Day 12 of 27 of the 1st Battle of El Alamein. German tanks attack Allied troops in the Tel el Eisa without success. East Africa: Day 69 of 186 of the Battle of Madagascar. CBI - China: Day 1,832 of 2,987 of the 2nd Sino-Japanese War. Day 59 of 124 of Japan's Zhejiang-Jiangxi Campaign, launched to punish anyone suspected of aiding the Doolittle raiders in China. Roughly 250,000 Chinese will be killed. PTO - Alaska: Day 36 of 435 of the Battle of Kiska, Aleutian Islands. PTO - Malaya: Day 144 of 357 of the Battle of Timor Island. 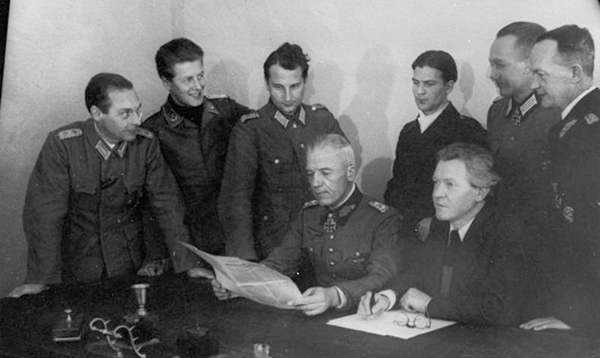 Russian Front: The National Committee for a Free Germany (NKFD) is formed in Krasnograd, Ukraine, made up of a number of German officers captured by the Soviets, as well as German communists exiled during the Nazi rise to power. Under the scrutiny of the Soviet Union, this anti-Nazi group calls for an uprising against Hitler and an end to the fighting between Germany and the USSR. With the German defeat at the Battle of Stalingrad, the number of German POWs rose and their belief in a victorious Germany was damaged, hence they were more open to the idea of membership in an anti-Nazi organization. In the manifesto of the National Committee for a Free Germany (NKFD), historical Prussian figures who had allied with the Russians against Napoleon are depicted as exemplary Germans. Its leadership consisted of 38 members, including 28 Wehrmacht POWs and 10 exiled communists. The main task of the NKFD was to deliver propaganda aimed at the German armed forces and to interrogate captured German soldiers to determine their true loyalty, looking for new recruits. They had their own newspaper and radio station. They sent leaflets to the German soldiers at the front and the POWs in the Soviet camps. As the Red Army entered Germany, some NKFD members were appointed as officials in the local government of the Soviet occupation zone, replacing Nazi officials. Russian Front - North: Day 673 of 872 of the Siege of Leningrad. Russian Front - North: Day 434 of 658 of the Siege of the Kholm Pocket. Russian Front - Center: Day 8 of 50 of the Battle of Kursk, Russia. The Soviets launch three major attacks toward Bryansk, Kursk, Orel and Prokhorovka. Russian Front - Center: Day 1 of 38 of the Battle of Orel, Russia. The Soviets launch Operation KUTUZOV named after the Tsarist General Mikhail Kutuzov credited with saving Russia from defeat during the invasion by Napoleon in 1812. MTO - Italy: Day 4 of 40 of the Battle of Sicily. RAF and US Air Forces provide air support. The British 8th Army captures Augusta, adding yet another useful harbor for Allied invasion forces. The HMS KING GEORGE V bombards Trapani. MTO: A US B-24 from the 1st Antisubmarine Squadron sinks U-506 near Portugal. CBI - China: Day 2,197 of 2,987 of the 2nd Sino-Japanese War. CBI - Indochina: US 14th Air Force bombs several targets in French Indochina. PTO: Day 47 of 47 adrift in a raft for the two remaining survivors of B-24 GREEN HORNET that crashed 850 miles from Hawaii. Tomorrow they will finally reach a Japanese-occupied island 2,000 from where they started, only to be captured by the Japanese Navy there. PTO - Alaska: Day 401 of 435 of the Battle of Kiska, Aleutian Islands. PTO - New Guinea: Day 82 of 148 of the 2nd Battle of Lae-Salamaua. US 5th and 13th Air Forces provide air support. PTO - Solomon Islands: Day 23 of 67 of the Battle of New Georgia. US 5th and 13th Air Forces provide air support. PTO - Solomon Islands: Day 1 of 2 of the Naval Battle off Kolombangara. Come nightfall, the Japanese Navy and US Navy clash in the battle which will last until morning. The USS GWIN and Japanese warship JINSU are sunk. ETO - France: Eldest son of former President Theodore Roosevelt, Brigadier General Theodore Roosevelt Jr, dies suddenly of a heart attack in Normandy. He was the oldest man to storm a beach in Normandy on D-Day. ETO - UK: Day 30 of 86 of the V-1 "Buzz Bomb" offensive on Britain. ETO - France: Day 37 of 49 of Operation OVERLORD, the Allied invasion of Normandy, France, known forever simply as D-Day. D-Day+36: Allied Air Forces provide air support. US troops make slow gains as they advance toward St Lo. ETO - France: Day 37 of 62 of the Battle of Caen. Although the town has been captured, the surrounding area still needs to be cleared of German troops. ETO - Germany: US 8th Air Force bomb targets in Munich. Russian Front - Finland: Day 22 of 50 of the Battle of Karelia. Soviet troops continue their offensive against the Finns in eastern Karelia between Lake Ladoga and Lake Onega in northern Russia. Russian Front - North: Day 162 of 191 of the Battle of the Narva Isthmus, Estonia. Both German and Soviet troops remain locked in their defensive positions. Russian Front - Center: Day 8 of 16 of the Battle of Vilnius, Lithuania. Russian Front - Center: Day 8 of 27 of the Battle of Siauliai, Lithuania. Russian Front - Center: Day 8 of 23 of the Battle of Belostock, Poland. MTO - France: US 15th Air Force B-24s bomb targets in southeast France. MTO - Italy: Day 27 of 34 of the Battle of Ancona (north of Rome). Allied Air Forces provide air support. CBI - Burma: Day 130 of 166 of the UK's Operation THURSDAY. US 10th Air Force provides air support. CBI - Burma: Day 125 of 147 of the Battle of Myitkyina. US 10th Air Force provides air support. CBI - Burma: Day 103 of 302 of the Chinese Salween Offensive. US 14th Air Force provides air support. CBI - China: Day 2,563 of 2,987 of the 2nd Sino-Japanese War. Day 87 of 259 of Japan's Operation ICHI-GO. Day 21 of 48 of the Battle of Hengyang. US 14th Air Force provides air support. PTO - Caroline Islands: US 7th Air Force bombs in the Truk Atoll during the night and again during the day. PTO - Dutch New Guinea: Day 11 of 61 of the Battle of Noemfoor. Although the island has been declared secured, bitter fighting from Japanese continues. PTO - New Guinea: Day 47 of 83 of the Battle of Biak. There are still 3,000 Japanese soldiers on the island who won't give up. PTO - New Guinea: Day 211 of 597 of the Battle of New Britain. US 13th Air Force provides air support. PTO - New Guinea: Day 82 of 481 of the Battle of Western New Guinea. 5th Air Force provides air support. PTO - New Guinea: Day 29 of 80 of the Battle of Lone Tree Hill. PTO - New Guinea: Day 3 of 47 of the Battle of Driniumor River, a failed Japanese attack on US troops near Aitape. PTO - Solomon Islands: Day 255 of 295 of the Battle of the Bougainville Islands. US 13th Air Force provides air support. 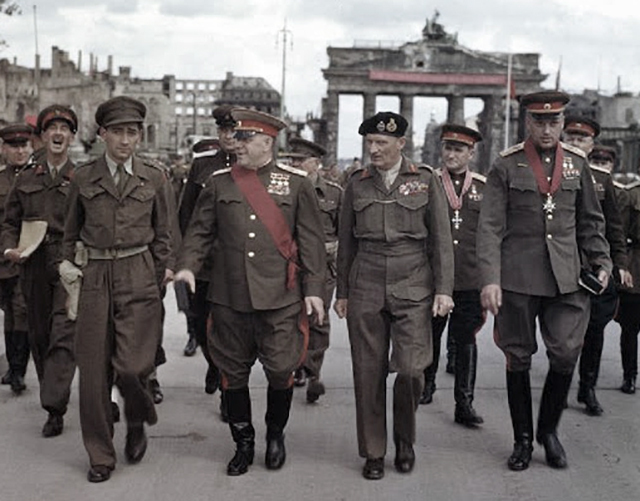 Berlin: The British honor Soviet General Georgy Zhukov and three others in a ceremony at the Brandenburg Gate for having planted the flag of victory over Berlin. The ceremony was held in front of a banner proclaiming "Glory to the Soviet forces who planted the flag of victory over Berlin." 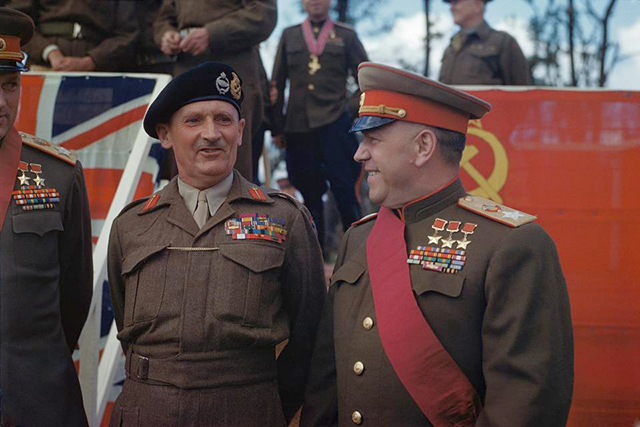 Deputy Supreme Commander in Chief of the Red Army, Marshal of the Soviet Union Georgy Zhukov was presented with the sash of the Knight Grand Cross of The Most Honourable Order of the Bath by Field Marshal Sir Bernard Montgomery. Other Soviet generals given the same honor in this ceremony included Konstantin Rokossovsky, Vasily Sokolovsky and Mikhail Malinin, all who would now, as citizens of the UK or the Commonwealth, be entitled to wear the title "Sir" in front of their names. The alliance between the Western Allies and the Soviet Union had always been an uneasy one, and at this point their relations were in swift decline, leading toward the eventual Cold War between West and East, which is said to have begun in 1946 and ended in 1991. The first use of the term "Cold War" was most likely used on 16 Apr 47 when American presidential adviser Bernard Baruch delivered a speech saying "Let us not be deceived. We are today in the midst of a cold war." But at this point in 1945, regardless of having made a "deal with the devil" with Stalin to help them, the Soviet Union's sacrifices and military prowess in helping bring an end to the Third Reich was undeniable. Zhukov and his fellow generals were very deserving of the honors bestowed upon them on this day. CBI: US 14th Air Force attacks many areas in China and French Indochina. CBI - China: Day 2,928 of 2,987 of the 2nd Sino-Japanese War. PTO - Alaska: US 11th Air Force bombs a Japanese freighter. PTO - Borneo: Day 33 of 67 of the Battle of North Borneo. US 5th and 13th Air Forces provide air support. PTO - Dutch East Indies: Day 12 of 21 of the 2nd Battle of Balikpapan. The Australians capture Maradi. PTO - Japan: US 20th Air Force B-29s night bomb the urban areas of Utsunomiya, Ichinomiya, Tsuruga, Uwajima and the Kawasaki Petroleum Center. PTO - New Guinea: Day 563 of 597 of the Battle of New Britain. US 10th Air Force provides air support. PTO - New Guinea: Day 447 of 481 of the Battle of Western New Guinea. US 10th Air Force provides air support. PTO - Philippines: Day 265 of 299 of the 2nd Battle of the Philippines, aka the Liberation of the Philippines or the Philippines Campaign. PTO - Philippines: Day 210 of 244 of the Battle of Luzon. The battle is said to over but hold-outs will continue fighting until the end of the war. PTO - Philippines: Day 125 of 159 of the Battle of Mindanao Island. The battle is said to over but hold-outs will continue fighting until the end of the war. PTO - Philippines: Day 117 of 135 of the Battle of the Visayas region. The battle is said to over but hold-outs will continue fighting for several weeks. PTO - Russia: Japanese representatives in the Soviet Union request an update on the Japanese inquiry on the extension of the 1941 non-aggression treaty, getting very little in the way of a response. Monty tells his side of the story of the momentous battles against the enemy - and, sadly, the Allies - as he strove for victory in WWII.